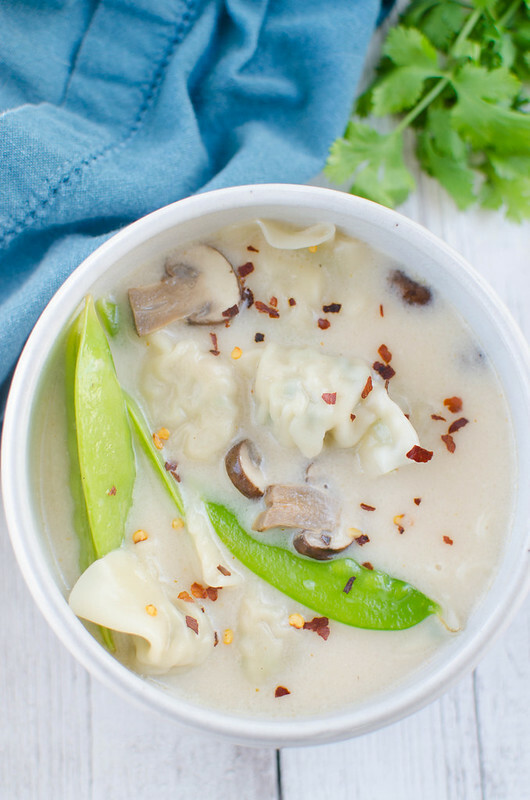 Spicy Coconut Wonton Soup – delicious 15 minute soup! 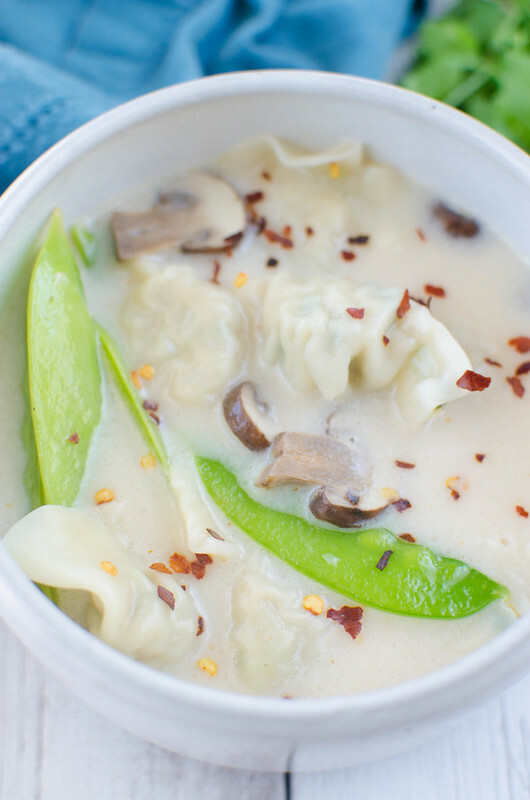 Spicy coconut broth with wontons, mushrooms, and snow peas! Important life update: I’m into brothy soups now. I, for my entire life, have been a thick soup person. You know, a squash soup. Or a chicken and rice soup. Or even a broccoli cheddar. 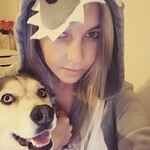 I didn’t like anything brothy. And then I became obsessed with pho a few years ago and it was my gateway to other spicy brothy soups and now I literally drink bone broth with a ton of sriracha from a coffee mug every morning of my life. Why am I obsessed with broth? It’s 137 degrees in central Texas right now but I’m still making soup everyday. 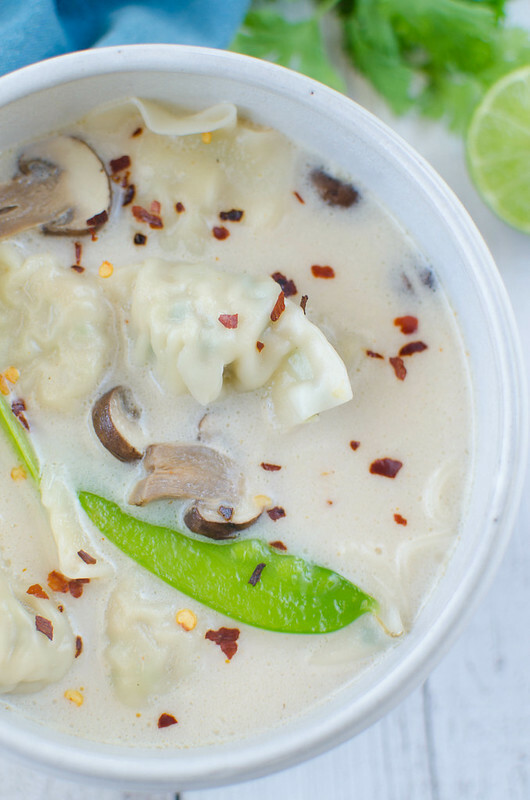 Like this Spicy Coconut Wonton Soup? Done in 10 minutes! 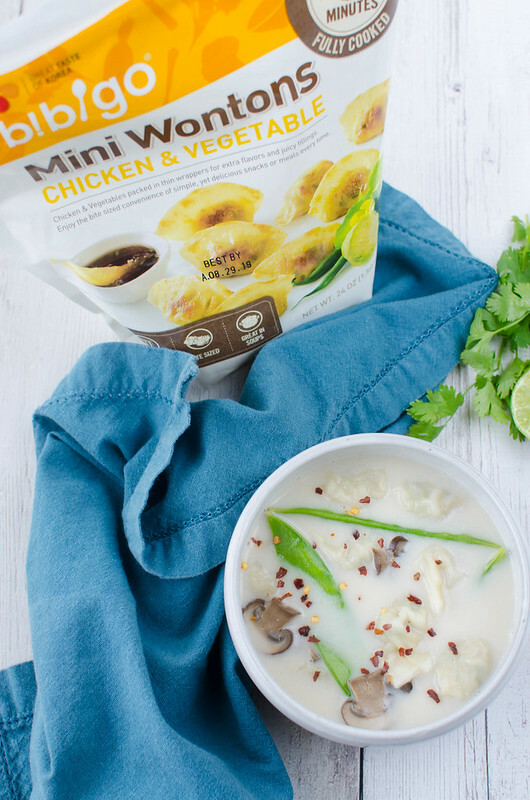 I’ve been using the Bibigo Mini Wontons Chicken and Vegetable Wontons in my soup recently because they cook in literally 2 minutes in boiling broth. They’re fully cooked so you just need to heat them through. And if you’re not into the soup idea, you can pan fry them in 5 minutes (my kids love them this way) or even pop them in the microwave for a couple minutes. 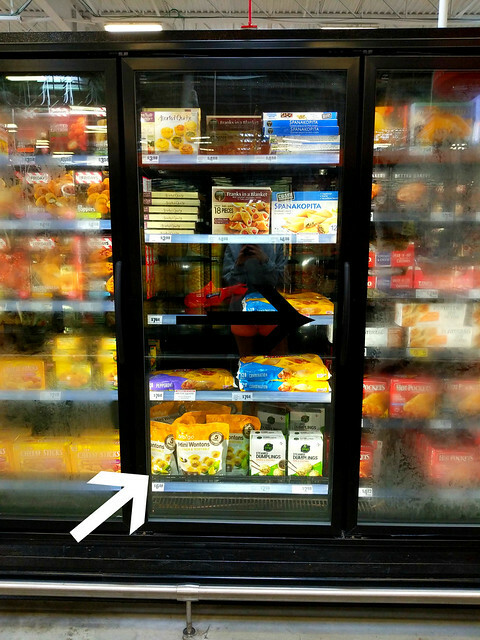 Good news: you can totally find them in the frozen section of your local H-E-B now! The word Bibigo comes from the Korean word “mix” combined with “go” because they offer an exciting line of products that you can kind of mix and match to create a fun and delicious meal. Bibigo products are simple, easy to make, and are balanced with nutrition, flavor, and texture. 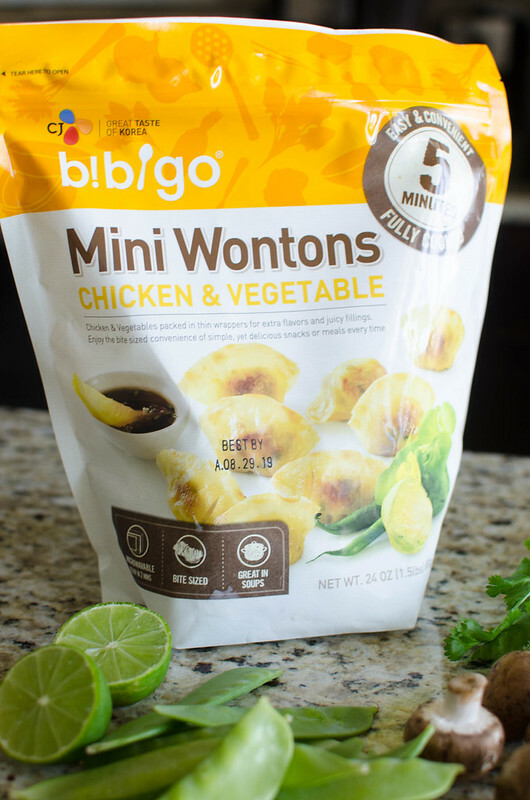 The Bibigo Mini Wontons Chicken and Vegetable Wontons are great to keep on hand in your freezer. They’re bite-sized and super versatile. For more information, visit the Bibigo website and follow Bibigo on Facebook for all their updates! 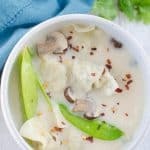 I love a really rich broth with just a touch of coconut milk added in for a bit of creaminess and a hint of coconut flavor so that’s what I did with this. Except I made it super quick. And there are no complicated ingredients – everything should be easily found at H-E-B. It’s spicy and comforting and have I mentioned that it cooks in 10 minutes? Totally season it to your taste. I like a ton of heat so I do several turns around the bowl with sriracha but if you like more citrus, add some more lime juice. I haven’t been into cilantro lately so I left it out but it would definitely be delicious. And crushed red pepper flakes add a nice heat and makes the top of the soup really pretty. In a large soup pot, add chicken broth, fish sauce, ginger, garlic, lime juice, salt, and sriracha. Bring to a boil, lower to a simmer, and allow to simmer for 5 minutes. Add in mushrooms, snow peas, and Bibigo Mini Wontons Chicken and Vegetable Wontons. Cook for 2 minutes, until the wontons are heated through. Divide among serving bowls and serve with lime juice, cilantro, and crushed red pepper flakes for serving, if desired. One Response to "Spicy Coconut Wonton Soup"